I shouldn’t lead with a sarcastic headline like that, but the prisoner trade executed by the White House is almost beyond belief. Almost, but this is the Obama White House, after all. Here’s The Hill’s latest report: Prisoner Swap Blows Up On WH. Even if you want Guantanamo closed, the trade is grotesque: behind Congress’s back, in violation of recent legislation, we have the release of five high-level Taliban, who themselves are very likely to have played a role in killing Americans, in exchange for a deserter who’s disappearance is strongly alleged to have cost the lives of several American soldiers. So far, it seems that everyone except Harry Reid is upset. 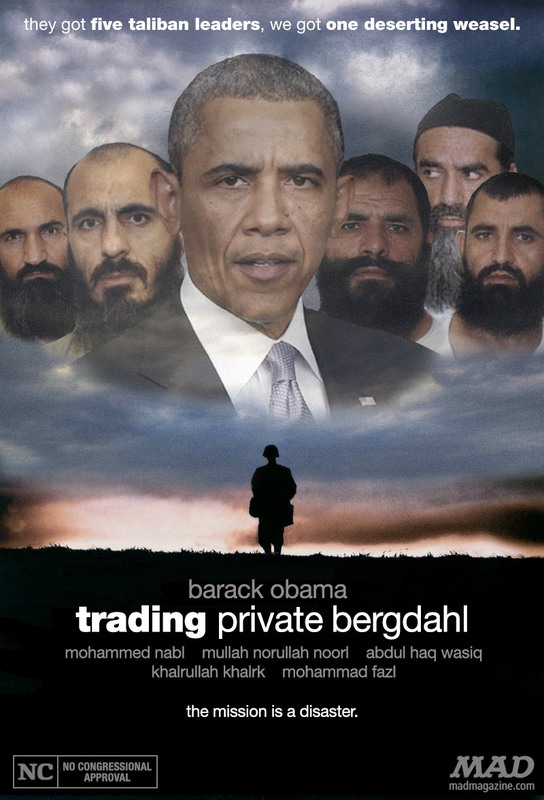 Mad Magazine’s take is shown in the pic above, but Bergdahl is a sergeant, not a private.